Steam has a bug problem. A big bug problem. Maybe you can help. 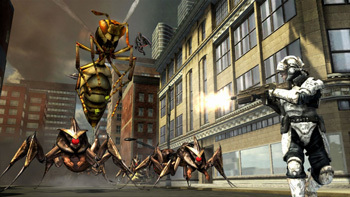 Earth Defense Force: Insect Armageddon is cheap in more than one sense of the word. It has a B movie plot, was made on a B movie budget and the version released on steam today has a B movie price. Until January 2nd you can pick it up for $14.99, a 25% discount off its regular price of $19.99. This release includes all the DLC released for the console version, and 4 new DLC weapon packs are in the pipeline. The game is pretty much exactly the same as its 360 counterpart, with one possibly deal-breaking omission; there's no split-screen. Developer and publisher D3 has also seen fit to limit the FPS to 30 for some ungodly reason. Is the game as good as cult classic EDF 2017? Well not quite, but with four classes, hundreds of weapons, three player campaign co-op and roughly a million ants to ventilate, there's a lot of fun here for $15.